Ed McMahon passed away last night. It wasn't a big surprise. He had been very ill with cancer for some months, and he was, after all, 86 years old. Still, his death comes as a shock. I suppose that no matter how old we are, the icons of our childhood and youth seem to us somehow immortal. That's what Ed McMahon was for me-- one of the landmarks of my life. It seems impossible that he is gone. 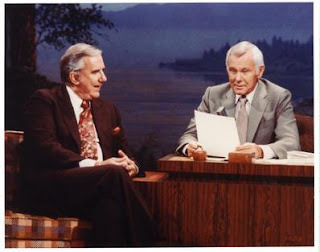 His " Heeeere's Johnny" at the start of the Johnny Carson Show marked my passage from high school to college, from college to job, to marriage, mortgage, motherhood and the other joys of adult life. He entered my bedroom every night after the evening news. My relationship with him was intimate in a way that those born into a world of Cable TV, TiVo and the Internet cannot imagine. I came of age in a world of rotary dial telephones and three TV networks. Johnny Carson was on NBC after the 11pm news and he ruled the late night airwaves. Johnny and Ed were major celebrities. Ed McMahon was always the perfect foil for Johnny's sharp verbal jabs and the most jocular of second bananas. He laughed at Johnny's jokes, peddled the sponsor's products, and always seemed like a big, strong, friendly bear of a man. It pained me in recent years to see him peddling geriatric products and burial insurance on TV. It seemed such a comedown. But then old age has a way of evening the playing field. Perhaps it is the fluttering of dark wings over my own head more than a personal loss I am feeling. Whatever it is, I feel a nostalgia for the Ed McManhon of my youth. He was a wonderful, larger than life figure with lot's of what we used to call " presence." Surely, when he reaches the pearly gates there will be a trumpet fanfare and St. Peter will greet him with a big " Heeere's Ed"
He really was a big bear of a man with a definite "presence". We passed backstage at a Jerry Lewis telethon one year, and I was amazed not only by how tall he was, but the way people parted like the waters of the Red Sea when they saw him coming. He was nobody's second banana outside the Tonight Show! So yes, it pained me too to watch him sell burial products and such. But ya do what ya gotta do. Did you hear the angels applauding and cheering last night after the "Heeeeere's Ed!"? There's a rumor that Johnny Carson was NOT amused... lol! I love the idea of the angels applauding and even the idea of Johnny being jealous -- thanks for the personal insight too. My goodness! After reading this I got so sad at the thought that so many kids from today and yesterday have no idea who he is, or what life was like in our time. It's so different. I "dialed" I didn't punch in. I used a "typewriter" not a word processor. I "turned the dial on the tv", I didn't flip through channels on the remote. My choices were simple. That extra channel was amazing. Sesame street, Mr. Rogers, Electric company, and Saturday morning cartoons (later on) were my kids shows. You were there when things were on, not the other way around. I think this is turning into a hub. lol.